After a decade in the French Foreign Legion following his enlistment as a teenager, the pressures of professional rugby hold little fear for France sevens player Tavite Veredamu. 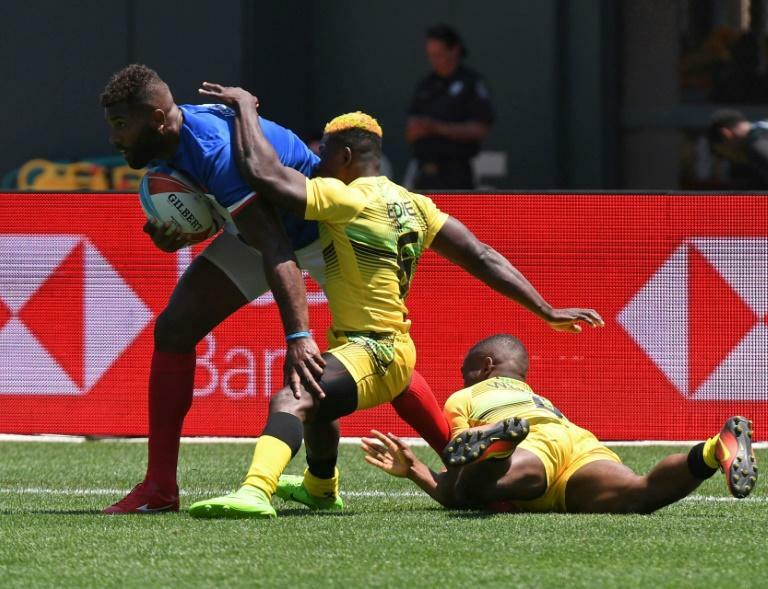 The 28-year-old Fiji-born wing is one of France's main attacking threats at this weekend's World Cup Sevens in San Francisco, a tournament appearance which caps a meteoric rise through the ranks of the French sevens set-up. Veredamu wasted no time on making his mark at AT&T Park on Friday, scoring France's opening try in a 50-0 demolition of Jamaica. He then capped off a superb opening day with two more tries including the winning score in a 22-17 victory Australia in the last 16 late Friday. The Fijian only made his debut for France last year after being fast-tracked into the French team. A senior corporal based at Colonel-de-Chabrieres barracks, near Nimes, he was spotted during a training session with the French army side. Since making his debut last December, Veredamu has made 44 appearances on the World Rugby International Sevens circuit, scoring 115 points. Despite a long tradition of Fijian rugby players ending up in France, Veredamu said he had no intention of a professional career when he made the decision to enlist. "I wanted to earn money for my family, so I chose the Legion," Veredamu told AFP. "But when I got the chance to represent France at Sevens, I was very proud." Veredamu has transferred to a logistics branch of the Legion after spending several years in a combat unit. His spell as a combat soldier included tours of duty in Djibouti and Mali where he fought jihadists. "I'm based in France but we've been on plenty of missions," Veredamu said. "I was five years in a combat unit. It was really tough. You don't have a regular life. "Life in the Legion is great but it's tough. The first year was very hard. Very different. A lot of training, not a lot of food, and not a lot of sleep. But after a few years I got used to it, the discipline, the military life." Veredamu, who plays as a flanker in the 15-a-side game, said he is happy to play professional rugby for France for as long as he is able. But he would be equally happy to return to his military career when he hangs up his boots. "I have a professional contract, but the army has said that afterwards I can always come back to the Legion," Veredamu told AFP.